At a time when scientific information is increasingly at the center of public divides, most Americans say they get science news no more than a couple of times per month, and when they do, most say it is by happenstance rather than intentionally, according to a new study by Pew Research Center. 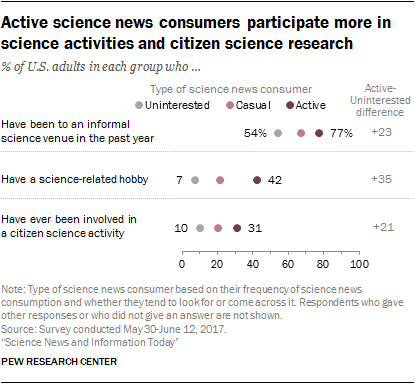 Overall, about a third, 36%, of Americans get science news at least a few times a week, three-in-ten actively seek it out, and a smaller portion, 17%, do both. 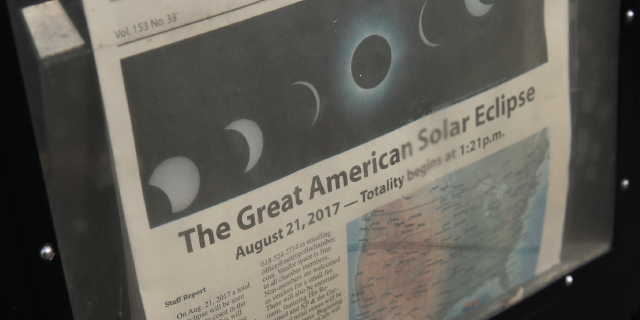 And while Americans are most likely to get their science news from general news outlets and say the news media overall do a good job covering science, they consider a handful of specialty sources – documentaries, science magazines, and science and technology museums – as more likely to get the science facts right. Public debates over science-related policy issues – such as global climate change, vaccine requirements for children, genetically engineered foods, or developments in human gene editing – place continuous demands on the citizenry to stay abreast of scientific developments. In terms of how these and other scientific research issues get communicated, at least four-in-ten U.S. adults see significant problems stemming from media practices, researcher practices and the public, themselves. But when pressed, Americans put more overall blame on the way media cover scientific research than on the way researchers publish or share their findings (73% to 24%). Social media, while prominent as a general news source, appear to play a modest role in informing Americans about science. Most social media users see science-related posts on these platforms, though only a quarter (25%) see “a lot” or “some” science posts; and a third (33%) consider this an important way they get science news. About a quarter of social media users (26%) follow science accounts; these users are much more likely to click through to articles on science posts and to consider social media an important way they get science news. Beyond news and social media, most Americans encounter science-related information through entertainment media and informal science learning venues such as museums or parks. And, amidst a growing array of options, some 16% have directly engaged with science research by participating in a type of citizen science research activity, themselves. These are some of the findings from a survey conducted among a nationally representative sample of 4,024 adults, ages 18 or older, from May 30-June 12, 2017. The survey asked about a range of issues from how the public encounters science news and assesses what and who to trust to other ways that people engage with science information in everyday life, including participation in citizen science research projects, hobbies, and consumption of entertainment programing built around science, medicine or technology. The margin of sampling error based on the full sample is plus or minus 1.6 percentage points. For details, see the Methodology. General news outlets – those that cover a range of different topics each day – are the largest providers of science news to Americans, even in this era when there is an increasing array of specialty science outlets.1 A 54% majority of Americans regularly get their science news from general sources, higher than any of the 10 source types asked about in the survey. Even the most active of science news consumers regularly get science news from these general news outlets. But general outlets, by a longshot, are not considered the most accurate – that distinction goes to specialty sources, specifically documentaries, science magazines, and science and technology museums. 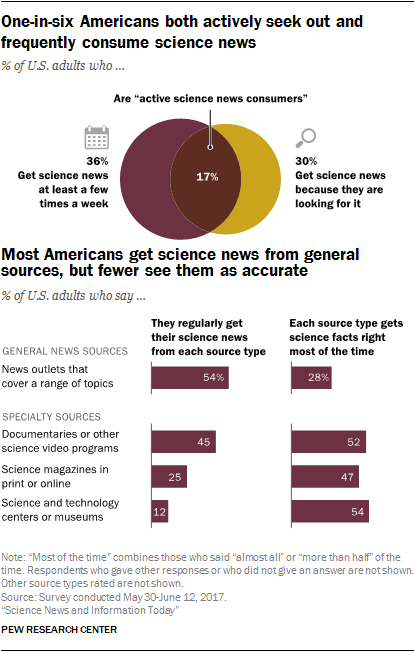 Fewer Americans regularly rely on these specialty sources for science news, but roughly half of Americans think that each of these three specialty sources get the facts right about science most of the time. Just 28% say the same of the general news outlets. 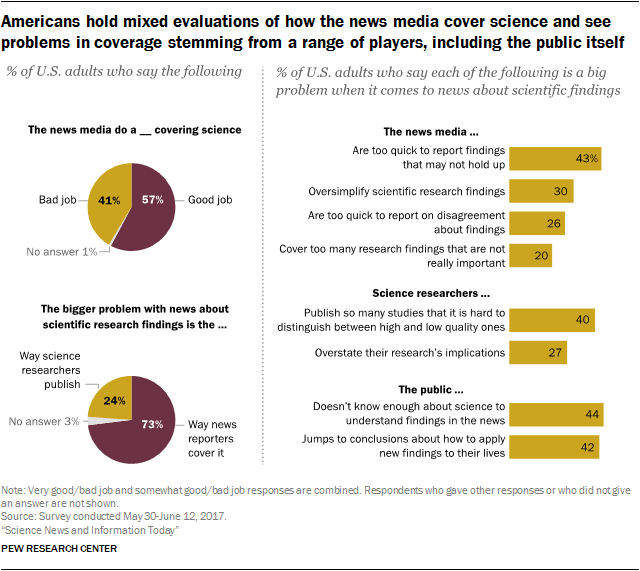 More than half (57%) of Americans say the news media do a good job covering science. This is consistent with earlier assessments of coverage of specific science topics, notably childhood vaccines, but stands in contrast to other more negative general assessments of the news media, such as their impact on the country. At the same time, sizable shares of the public see problems in news coverage of scientific research stemming from the media and from researchers, as well as the public themselves, though less than half name any of eight potential problems as major ones. Still, when pressed to choose, nearly three-quarters of the public (73%) says the way the news media cover scientific research is a bigger problem than how researchers publish and share their findings (24%). Social media – a now prominent way in which people encounter and share news and information, particularly among younger Americans – appear to play a modest role in informing Americans about science news. 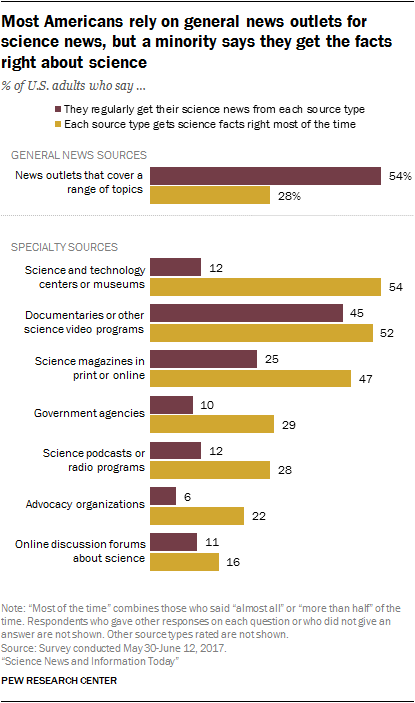 Most social media users see science-related content but only a quarter (25%) see “a lot” or “some” science posts on these sites, and only a third (33%) consider it an important way they get science news. Still, about a quarter of social media users (26%) say they follow science related pages and accounts. 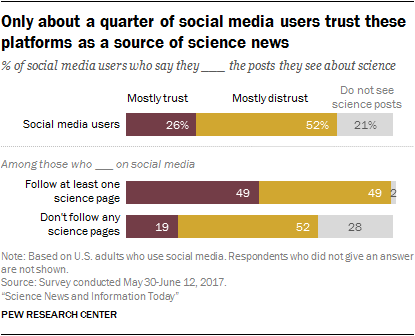 And this group places both more importance and comparatively more trust on science news that comes to them through social media. Another social aspect of science news – interactions with family and friends – also plays a relatively modest role. A third (33%) of Americans say they regularly get their science news from family and friends, and even fewer (17%) talk with others about science news at least weekly, far lower than shares found in past surveys focused on talking about news generally or discussions of politics. And, just 16% of Americans perceive their family and friends to be accurate sources of science news, far fewer than say general news outlets and most specialty sources get the facts right about science news most of the time. This finding is broadly consistent with a 2016 report that shows that more Americans perceive the news they get online from news organizations to be accurate than say the same of people they are close with online. 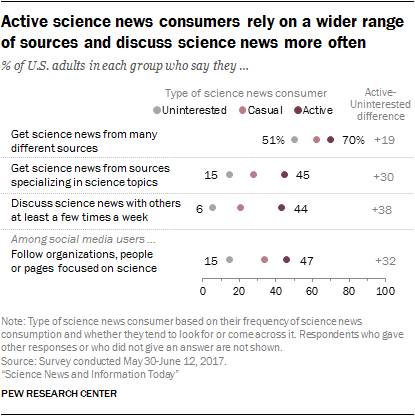 A small but active group of science news consumers is embedded within the general public; they are distinctive in how they use and evaluate science news. 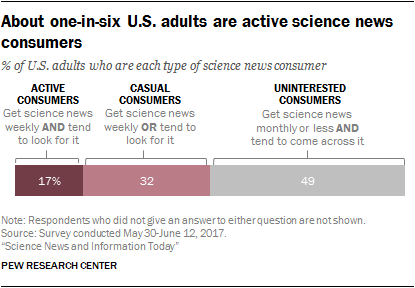 Roughly one-in-six U.S. adults (17%) both get science news at least a few times a week and tend to seek it out. These active science news consumers enjoy following science news more than news on other topics, turn to more types of science news providers, are more likely to discuss science with others, and those on social media are more likely to follow science pages or accounts. This group also has a greater tendency to think that each of the nine source types asked about in the survey is accurate. More than seven-in-ten active science news consumers say science and technology museums (74%), science documentaries (73%) and science magazines (72%) get the facts right most of the time. In contrast, minorities of uninterested science news consumers think each of these sources is accurate more than half the time. 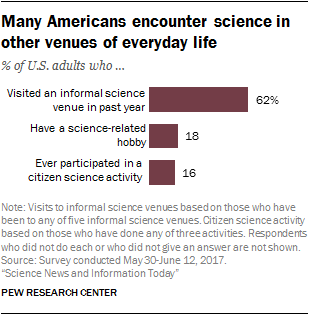 Active science news consumers are more likely than other Americans to have been to a park, museum or other informal science learning venue in the past year, to have a science-related hobby, and to have participated in a citizen science activity such as collecting data samples or making observations as part of a science research project. This group tends to be more educated and to have higher incomes. Men are more likely than women to be active science news consumers (22% vs. 12%, respectively), consistent with men’s somewhat higher level of interest in science news. But there are no differences by age and no more than modest differences by race or ethnicity in the share of active science news consumers. Despite wide political divides in views connected with climate change, energy, and funding for science research, as well as over trust in news about government and politics more generally, there are few differences between political party groups in how people consume science news. Republicans and Democrats (including independents who lean to each party) are equally likely to be active science news consumers (17% and 18%, respectively). And, roughly seven-in-ten of each party says they are very or somewhat interested in science news. The vast majority of both groups say they often or sometimes consume science-related entertainment media, whether about criminal investigations, medical shows or science fiction. Political divides emerge in judgments about science news. 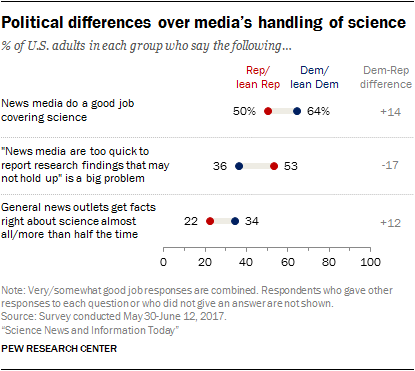 Roughly two-thirds of Democrats (64%) say the news media do a very or somewhat good job in covering science, while Republicans are more evenly divided. And, when asked about potential problems in coverage of scientific research a larger share of Republicans (53%), especially conservative Republicans, find fault with media coverage, saying it is a big problem that the news media are “too quick to report research findings that may not hold up.” Just 36% of Democrats say the same. By the same token, Democrats (34%), especially liberal Democrats, are more likely to think that news outlets covering a range of topics get the facts rights about science most of the time than are Republicans (22%). Medical and forensic television shows and movies – such as Grey’s Anatomy, House and the CSI franchise – have popularized diverse fields of scientific research. And, science fiction shows and movies, a now commonplace genre in entertainment offerings, capture the public imagination – as well as that of some inventors – with a portrait of what could be. In contrast with science news consumption, a wide swath of Americans see science-related content through entertainment media. Fully 81% of U.S. adults say they watch one or more of these types of programming (shows or movies about criminal investigations, hospitals and medical settings, or science fiction) at least sometimes. 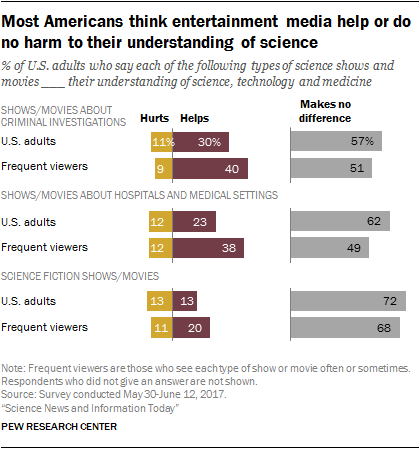 Further, the survey finds viewers of science-related entertainment believe that these films and shows provide, on the whole, a positive impression of working in science, technology and medicine. For example, 56% of Americans who watch shows about criminal investigations at least sometimes say these programs give a positive impression of working in science, technology and medicine; by contrast just 9% of these frequent viewers say the shows and movies create a negative impression, a third (33%) say they give a neutral impression. About two-in-ten adults (18%) have a science-related hobby or interest such as outdoor and naturalist activities, astronomy, computer programming and technology-related hobbies. And about one-in-six Americans (16%) say they have participated in a citizen science research activity, whether helping to collect data samples for a science research project, contributing to an online crowdsourcing activity, or participating in a maker movement or hack-a-thon. Those with higher levels of education and income are more likely to participate in each of these kinds of science activities, consistent with past studies.6 As noted above, active science news consumers are more likely to have been to an informal science venue, to have a science-related hobby, and to have participated in a citizen science activity. Younger adults (ages 18 to 29) are modestly more likely than older adults to have done these things.